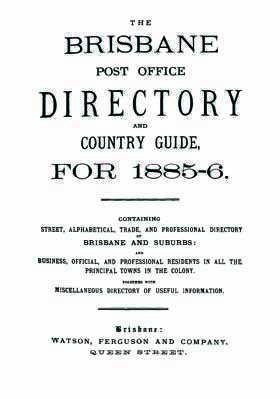 This Brisbane Post Office Directory and Country Guide contains a comprehensive Brisbane Street directory, Brisbane and suburbs alphabetical and trades & professional directories and much more. It also includes Queensland country town directories which list the names and professions of many people in Queensland in 1885 to 1888. Directories are an extremely useful tool for establishing when and where a person lived. However this is just a starting point, look further in the directory to find out more information about the society in which they lived, the occupations they held and the people they knew. This is an incredible genealogy resource for anyone exploring their family history in Brisbane or building a family tree.